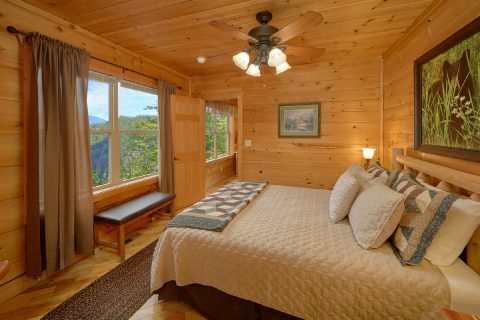 Enjoy scenic timber top cabin views from your Wears Valley cabin rental, "Tip Top!" 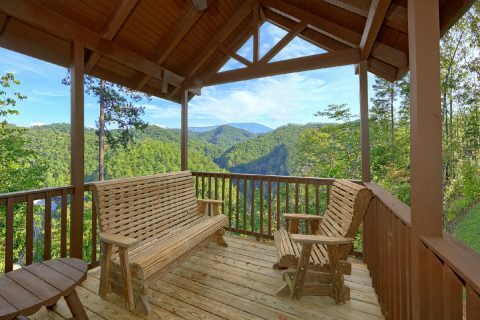 Only minutes from Pigeon Forge and offering endless breathtaking views from its porches, your Wears Valley cabin gives you and your guests a chance to enjoy the best of both worlds in the Smokies. 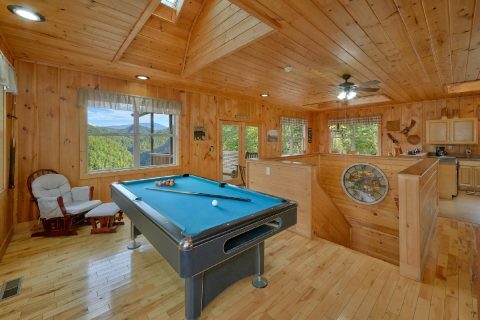 "Tip Top" cabin boasts timber top cabin views, providing a spectacular display of nature’s scenic beauty in the Wears Valley area. 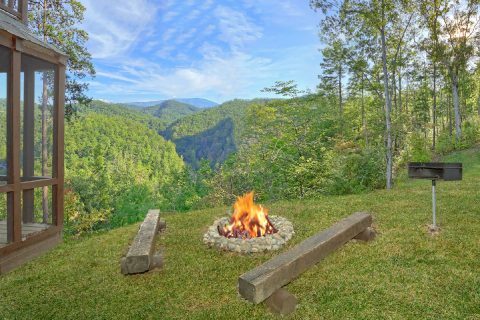 Words cannot express the full beauty or capture the relaxing impact one feels when basking in such natural splendor during any season. 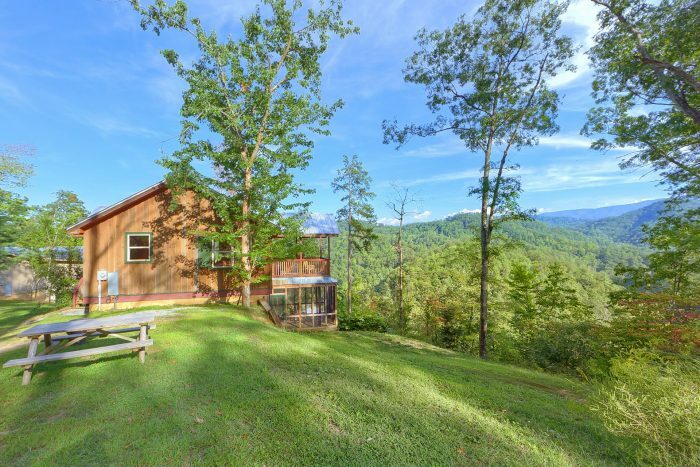 Looking out onto these stunning views from your Wears Valley cabin will be a memory treasured for years. 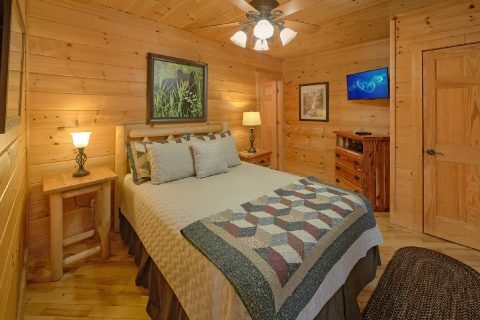 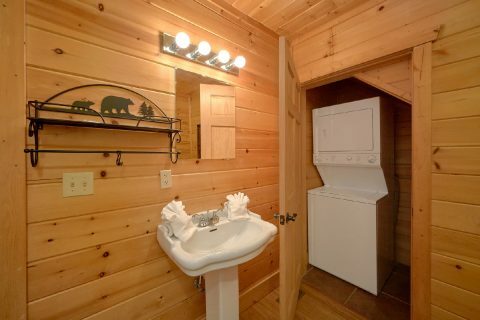 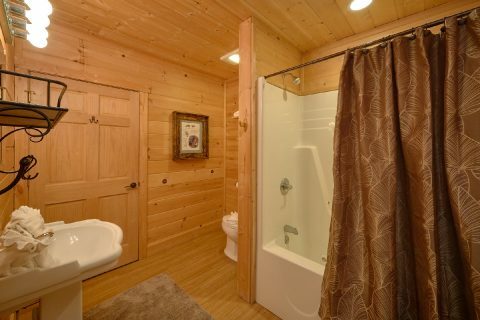 Inside, your Wears Valley cabin features 2 comfortable bedrooms and contains sleeping accommodations up to 6 guests, making this cabin perfect for families or couples looking to relax in a beautiful mountain setting and still enjoy all the comforts of home and a location close to all the attractions of the Smokies. 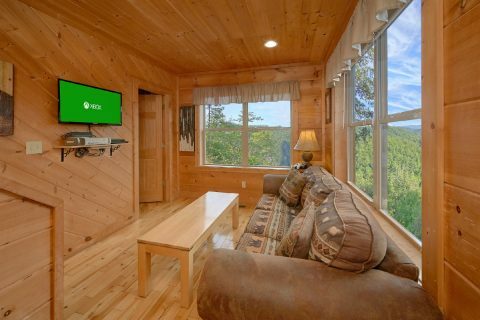 "Tip Top" cabin’s spacious living area has plenty large windows for bringing in the scenic beauty that surrounds your cabin. 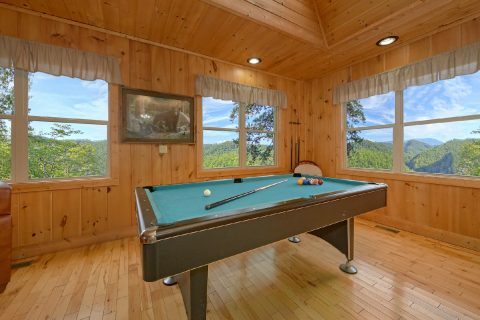 The living room's sleeper sofa near the gas fireplace provides extra sleeping space, and the nearby pool table and arcade game table offer family fun anytime. 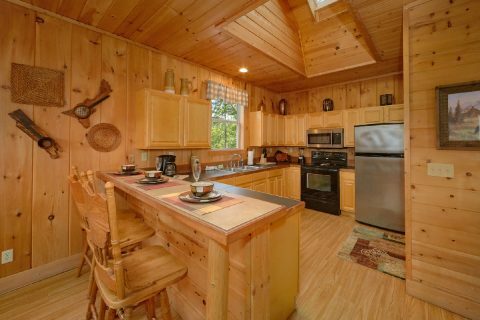 The cabin’s spacious kitchen with breakfast bar, charcoal grill, and a large dining area allows you to appreciate relaxed family meals in your Wears Valley cabin. 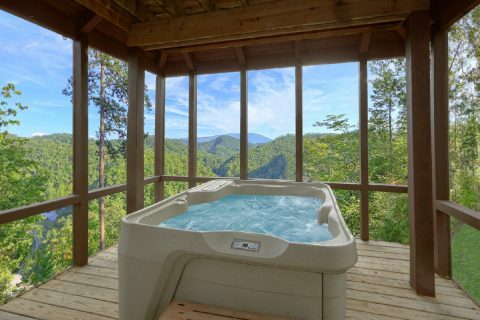 Outside, you can enjoy a relaxing dip in your hot tub. 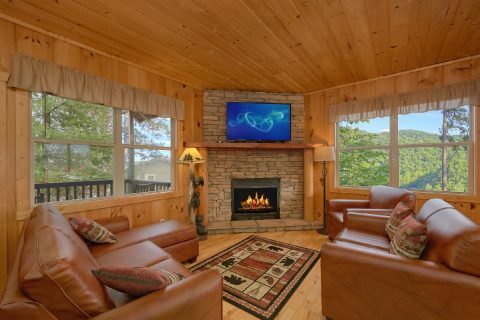 On the lower level, you'll find a sitting area with large picture windows and a television. 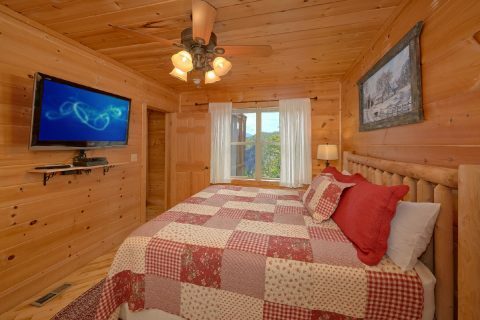 Off to the left, the king size bedroom offers a great place to rest with its own private bathroom and television. 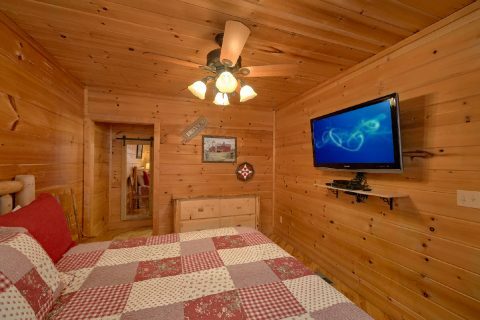 Down the hallway, the second bedroom boasts a queen-size bed, television, and private bath. 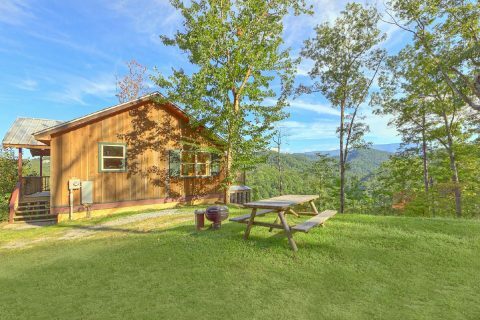 "Tip Top" cabin’s two large covered decks peer over the timber tops for breathtaking views of the Smoky Mountains you and your guest may enjoy from any of the several rocking chairs. 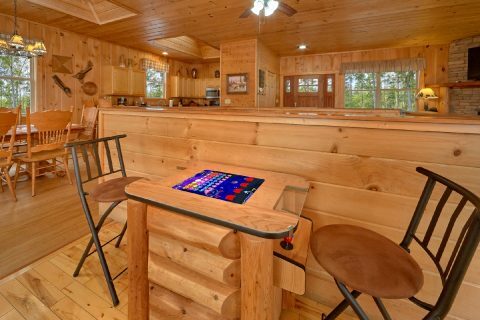 Enjoy timber top cabin views today! 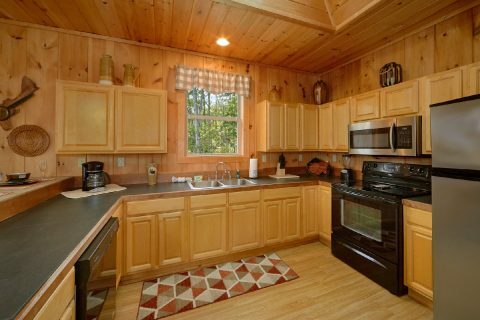 Book your Wears Valley cabin rental ONLINE and get an immediate Online Cabin Rental Discount! 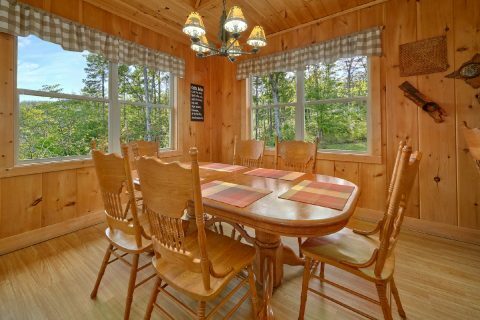 "Tip Top" rests within walking distance of "Hilltopper," "Bear Hugs," and "Higher Ground," making this cabin grouping a perfect location for family reunions or small church retreats. 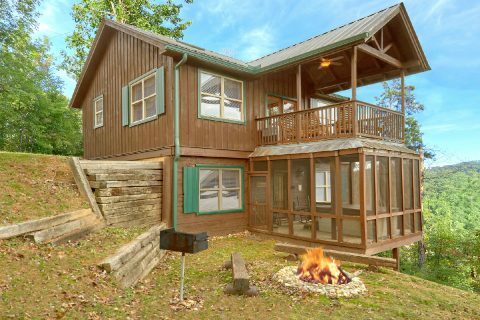 Four Wheel drive vehicles are highly recommended for this mountain top cabin during the winter months.